'Prayer of Moses after the Israelites go through the Red Sea' is a painting by Russian artist Ivan Kramskoi. The painting was completed in 1861. The size of the canvas - 56" x 41". Located in Belarusian National Arts Museum. 2“You shall not make for yourself a carved image, or any likeness of anything that is in heaven above, or that is in the earth beneath, or that is in the water under the earth; you shall not bow down to them nor serve them. For I, the Lord your God, am a jealous God, visiting the iniquity of the fathers on the children to the third and fourth generations of those who hate Me, but showing mercy to thousands, to those who love Me and keep My Commandments. I prefer Kandinsky to this sort of thing. I prefer Kandinsky﻿ to this sort of thing. 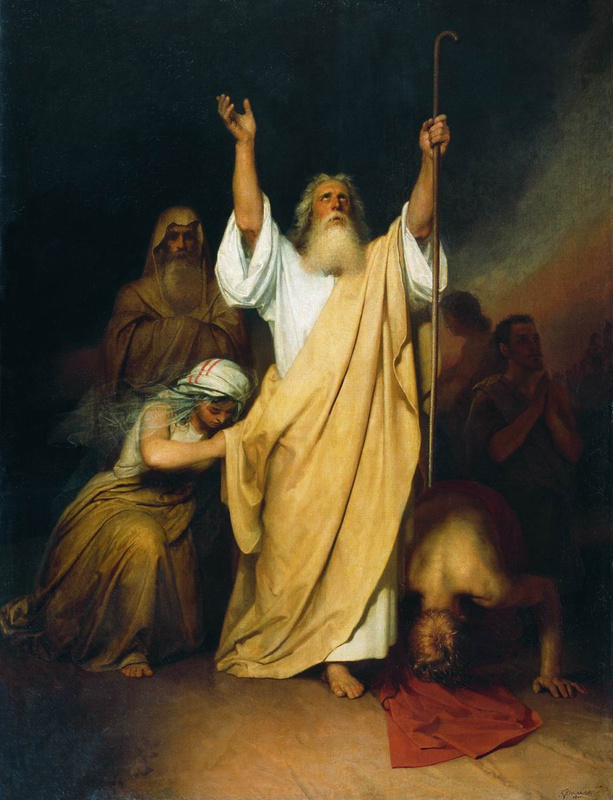 Pictures of Moses fail to impress me. I'd rather hang a Kandinsky on my wall, or a Mondrian or a Modigliani. It seems as though this Russian artist was deliberately violating this commandment. It is antiquated and trite. Not my taste at all. Who the eff needs jealous gods? Not I.
I am sure there are many great things to see in Russia. I have been to the Louvre and the Prado. Each museum has its charms. I just am not fond of Biblical themed paintings. I would prefer it to Putin. Putin has people killed. Are crimea and whiteman the same? how many russian trolls do we have here? The US war complex has MILLIONS killed.....yikes....ouchy.